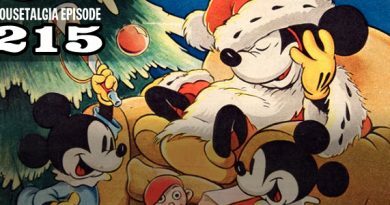 Walt Disney and World War II: In this special Memorial Day episode, Team Mousetalgia reports on a weekend event at the Walt Disney Family Museum about the Walt Disney Studios output during World War II, featuring presentations by historian Paul F. Anderson. Learn about the various projects and films that the studio created during this critical period of American history. Also – take a closer look at one of the more famous propaganda films, “Victory Through Air Power,” which Walt Disney believed would help end the war and save lives. Plus – an exclusive presentation of a 1943 radio program featuring Walt Disney talking about “Victory” – and more!